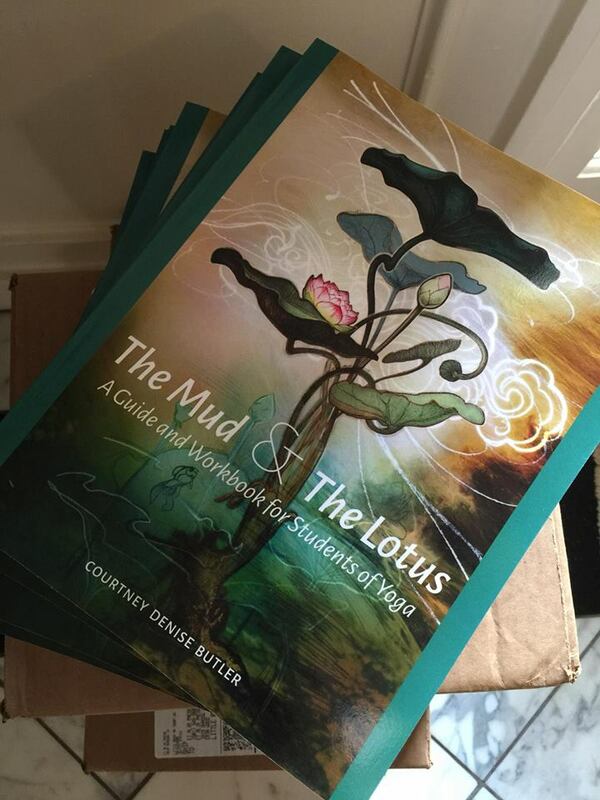 Congratulations to The Mud & The Lotus author Courtney Butler, who has been invited to present at the Texas Yoga Conference in Houston this April. Butler will speak about the therapeutic benefits of yoga for heart and cancer patients. We look forward to celebrating the successes of this conference! Et Alia invites you to follow our "Creative Space" blog series, in which we visit the creative spaces of our family of authors. Today, you can take a peek at the peaceful spot for The Mud & The Lotus: A Guide and Workbook for Students of Yoga Author Courtney Denise Butler, as well as the second half of a two-part interview with the author. Ready to order Butler's book? Enjoy 15% off, plus one of Courtney's Jumbo Yoga Cards free this week only when you use code CSPACE at checkout. Courtney, how would you describe your creative space? The words I associate with it are meaningful and peaceful. In this room, I'm surrounded by things that mean a lot to me, like my mala beads which were blessed by the Dalai Lama, reminding me of the time when I went to see him during his visit to the University of Arkansas in 2011. 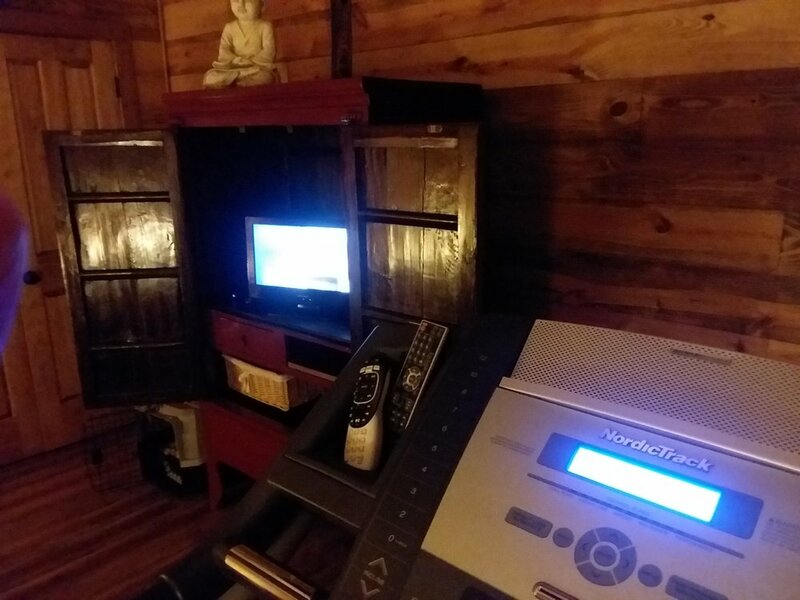 There's a 3' x 4' space at the corner of the room [pictured below with Buddha and crystals] where I place my meditation cushion during daily meditations. From my desk, if I'm having a moment of stress, I can catch a glimpse of that corner and it sets me at ease. I also practice yoga and exercise here. 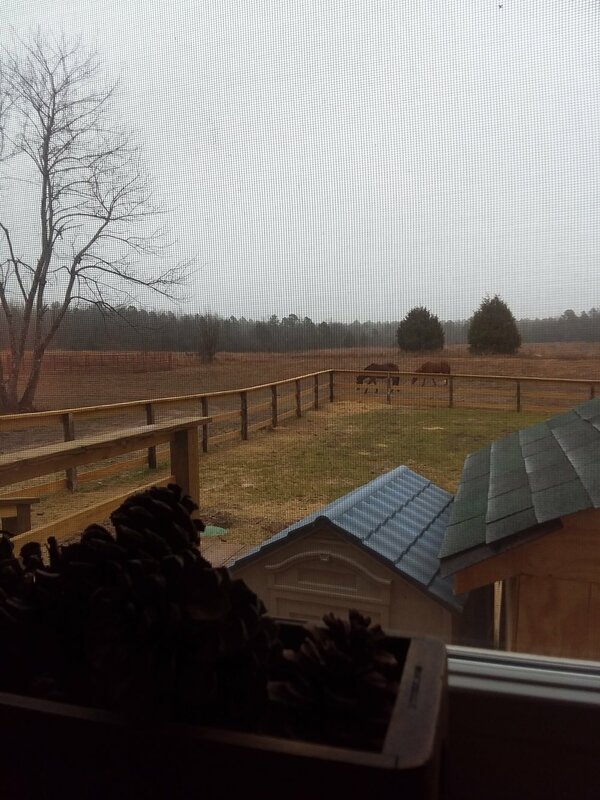 I can look out at the farm and see all my animals, which right now includes three grazing donkeys. I just adopted a mom, baby, and daddy donkey after their owner passed away at age 92. He really loved them, petted them every day, and it shows . . . they are very affectionate. My buddy Jameson the dog is often sitting behind me as I type, write, or record. 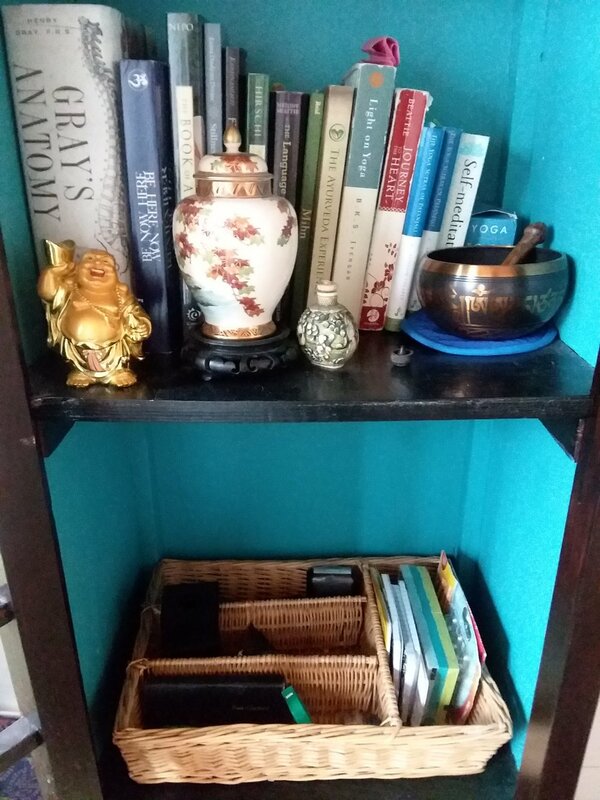 At one corner of my desk, you can see my mini recording studio, where I do videos, Skype consultations for students and yoga studios, and audio recordings for the Insight Timer Meditation App [find her by searching Courtney Butler]. What follows is PART II of Et Alia's interview with Courtney. What kinds of changes have you observed in the yoga world over the past two decades? In the past 18 years I've seen yoga change as something very misunderstood—with only a handful of teachers and schools—to being on practically every corner, with schools and certifications for various styles of yoga all over the place. In the South where I live, until recently there was much misunderstanding of what yoga is and is not, and until the past 15 years or so there were not many teachers in the South. In the early days, I was looked upon suspiciously when I told people that I was a teacher of yoga or a practitioner. I was even called a witch! There were only three of us teaching for many years in my hometown but, in some part due to my owning a yoga school here, that number has grown to at least two dozen in the past ten years. It was serendipitous in so many ways. We needed a new manual for my yoga school so I was working on updating the old material and creating a new workbook. At the time, I knew IAYT was going to be coming out with yoga therapy credentials, and I was also doing a lot of traveling teaching workshops and taking workshops trying to get as much yoga therapy training as possible. I kept meeting people who had taken teacher training, but they were choosing not to teach based on feeling a lack of knowledge. Or, many of those who were teaching were expressing to me that they were struggling with feeling they were missing some element they needed. I knew I had a strong curriculum and I was often taking teachers who had already gone through a training and retraining them. I was also doing some consulting with studio owners and teachers nationwide who wanted to open schools but were not sure how. So I thought, “What if I sell my curriculum?” Some people do this but it's often very expensive and hard to find. It's also often very rigid, and doesn’t make for an accessible read. I was noticing a lot of things I was doing were showing up in other schools familiar with mine . . . my curriculum outlines, my schedules—all things I knew I had learned through trial and error or from my teachers, and not things new teachers would simply know easily. but they were on my website. Why not sell a detailed guide with all my experience and help those schools I thought. I was in my Y12SR training and I heard Nikki Myers say "You can't keep it without giving it away," which is a 12-step slogan. That sealed the deal for me. I thought if I create it and sell it at a reasonable price I'll help other teachers, students, and schools keep alive these teachings that seem to be getting lost in our capitalistic society. I've always thought the best way to teach the masses is to teach people to teach rather than trying to teach twenty classes a week myself. In that way, we keep handing it down and more people gain the benefits of this ancient practice. You are available for nationwide presentations and consulting on many aspects of the yoga business. As you take The Mud & The Lotus nationwide, what are your goals with it, and what doors do you hope it will open in your life? My sort of life mottoes are "Just do the next right thing" and "let curiosity lead you." I thoroughly enjoy working with teachers, studio owners, and school owners. I love to research and problem solve. Since my experience is vast in the types of positions I've held in the yoga world I'm often able to help solve a variety of problems because I've usually dealt with it myself. If I can help a studio owner stay in business that makes me really happy. In one case I helped a teacher decide to close her studio and go back into teaching for others and she was so much happier and less stressed in the end. That was also amazing. I would like to write another book on yoga as a therapeutic practice, and hope to have that out in a year or two. My hope is that more schools will seek me out for consulting for their schools as they use the book to teach, because I can almost guarantee I’ll save them money and strife by helping them learn from my own mistakes and experience over the years. It would be lovely to lead workshops and do speaking engagements that help teachers, studio owners, and schools to reduce some of the stress and take some of the pressure off of them. I want to assist those folks in being the best they can be and maybe some of my trials, errors, and accomplishments can serve to make the road a little easier for someone else. It is pretty amazing that you have every certification available from Yoga Alliance. I mentioned your C-IAYT above, and you also have your 500 E-RYT, RCYT, RPYT, and YACEP, are certified in Yoga of 12-Step Recovery (Y12SR), and are a Prime of Life Yoga® Teacher. What do all these crazy letters mean? ERYT 500: Experienced Yoga Teacher with a minimum of 500 hours of training and 2000 hours minimum in the classroom. RCYT: Trained yoga teacher in Children’s Yoga, minimum of 295 hours of required training total. RPYT: Training in Prenatal Yoga: minimum of a total of 295 required training hours. YACEP: A teacher who is trained and qualified to give Continuing Education hours. Must have a minimum of 1,000 hours of teaching and 200 hours of training. C-IAYT Certified Yoga Therapist: 1,000 hours of training, certified by the International Association of Yoga Therapists. I was grandfathered in, which meant at least 10 years of practicing yoga therapy that I could document. It meant turning in at least twenty case studies of specific clients and what I did for them, how I did it, how long I worked with them and the outcomes. It also meant turning in all my training hours which were well over 1,000. I had to submit a resume with all my credentials, experience, and study. What is the yoga of 12-step recovery? We call it Y12SR, and it's amazing. My easy answer is that this work combines cognitive and somatic experience. By that I mean mixing movement through yoga postures (the somatic portion) with breathing and meditation, with discussion and study (the cognitive portion). Sessions include a meeting based on similar methods and the same guidelines used in other 12-step programs, with the addition of a yoga practice of asana with breathing and meditation. The program is worldwide and incredibly popular with impressive outcomes. The founder is Nikki Myers who has an inspirational story, and is a powerhouse of a woman doing great work. What is Prime of Life Yoga®? Prime of Life Yoga is what founder Larry Payne, Phd, calls yoga for the age range of about 40 to 70. Of course each person is unique and not everyone fits a perfect category depending on age, but the practice is made to fit people who may not need chair yoga, but also might get hurt in a fast moving class with aggressive postures. Larry often uses “The modern-day teachings of Krishnamcharya” to describe this work, in reference to this style which is adapted to fit the needs of the students. I'm grateful for Larry, his work, and his teaching, and am proud to call him one of my teachers. He was so kind in giving me a blurb for my own book, and I am forever grateful and humbled by his kindness. He is a true yogi in every sense of the word. What does it feel like to know you were among the first yoga therapists? The words "yoga therapist" were not even used until the past decade. Yoga Alliance was just being formed when I started teaching, so schools were not as common, and there weren’t standards. It was more a handing down of tradition from teacher to student. I had been practicing for many years when it formed and was mostly self-taught with connection to a few teachers mostly through personal study. I wanted the credentials mainly because to learn as much as possible. I had no intentions of being where I am now with a career in this field. I found two amazing teachers in Robin Johnson and Elana Johnson who had traveled to California to get training. I studied under them and have gone on to study with many amazing teachers, achieving more credentials like yoga for those over 40 and yoga for those with addiction. In my career I've seen many of the modern-day gurus who brought yoga to the West pass on. I'm so grateful to have been alive when they were still here sharing their work and knowledge. I've been fortunate to be able to meet and work with people like John Kepner, the executive director of the International Association Yoga Therapists, and Larry Payne, Phd, the founding father of IAYT. It's been purely by what I believe is divine intervention that I've had the good fortune to study and train with so many people who trained with Krishnamcharya and his son Deskicachar. I simply loved yoga and especially loved and had a heart for bringing yoga to the general population but also those who needed a more therapeutic practice. My background was in physical therapy. I originally went to college for PT, and put in many volunteer hours in hospitals in the PT departments. Then I worked at the school for those with disabilities in college. I've always had a heart for service and so was simply following my curiosity and heart. I used my experience and adapted yoga postures and practice in this way for my clients. When IAYT came out with new standards I was asked to do the beta testing. There were 14 of us, I believe, around the world. I wasn't even sure if what I was doing was what they wanted, but quickly became aware that what I had been doing for nearly 15 years at the time was exactly what they were looking for. I applied immediately when they opened it up to seasoned yoga teachers who had been doing yoga therapy. It was one of the highlights of my career to be accepted to receive credentials based on all my years of work. It was a tremendous honor and I'm truly grateful. Interested in the chakras but feeling overwhelmed about where to start learning about these energy centers of the body? How can objective observations about where you feel emotions in your body lead you to balance? Check out THE MUD & THE LOTUS author Courtney Butler's 12 minute talk "Understanding How We Feel the Chakras," free from the Insight Timer app. Search Courtney Butler, see this illustrative talk pop up, and join the more than 2,500 people who've already listened and more than 350 who've given this talk 4.5 stars. Ready to learn more about the Energy Anatomy of the body? Read The Mud & The Lotus, or enjoy our Jumbo Energy Anatomy Card, taken from among the many useful charts and illustrations you'll find in the book. Join us at Hillcrest HarvestFest this Saturday! Join us in Little Rock this weekend for Hillcrest HarvestFest! 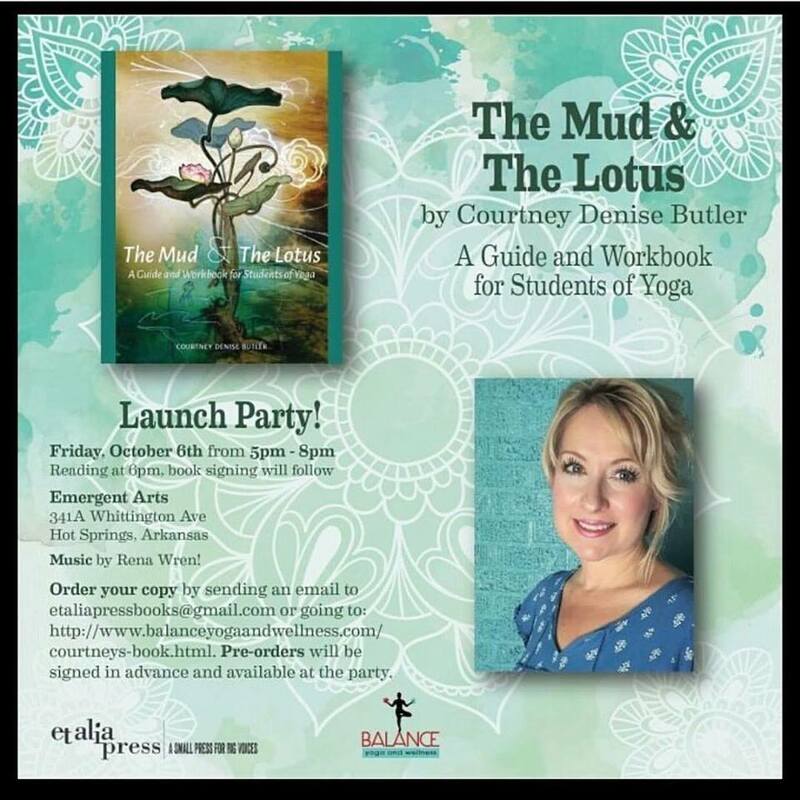 Meet The Mud & The Lotus: A Guide and Workbook for Students of Yoga author Courtney Denise Butler. 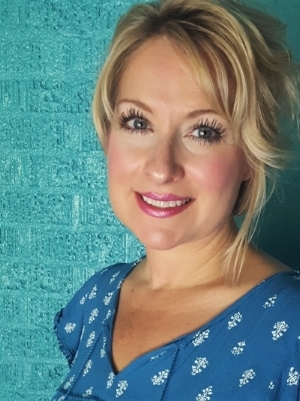 Courtney can sign your book and talk to you about all things yoga, yoga business, and writing. Purchase your just-released copies of Home Sweet Home: Arkansas Rescue Dogs & Their Stories, with $1 from every book sold to be donated to Rock City Rescue. You'll want to stock up early on this book that is sure to be a favorite of the holiday season. Get special deals on our books to be revealed the day of HarvestFest. Learn about submitting to our Neglected Histories of Arkansas Contest, judged by poet and professor of creative writing HK Hummel and Arkansas Arts Center Executive Director Dr. Todd Herman. Meet members of our team and learn more about our Little Rock-local small press for big voices. Get your signed copy of Scars: An Anthology edited by Erin Wood. Considering getting your yoga teaching credentials but not sure which yoga school would be best for you, how much to spend, or whether you even need to attend school at all (versus a yoga workshop or retreat)? There are many factors to consider and author of The Mud & The Lotus: A Guide and Workbook from Students of Yoga, Courtney Denise Butler, offers guidance in this video. What yoga school is right for you? Advice from veteran yogini, Courtney Denise Butler. Enjoy PART 1 of a two-part interview with The Mud & The Lotus: A Workbook and Guide for Students of Yoga author Courtney Denise Butler. I can't say that I have a favorite simply because I look at postures as healing and balancing for whatever is going on in my life. Therefore, postures are more prescriptive in nature, and I appreciate the balancing power in all of them. What is your favorite place to meditate? Wherever I am. At home, I have a bonus room with a meditation cushion, and in the nearby window I have some meaningful items that make me feel peaceful. I often sit facing this window with its lovely view and meditate there with my little tokens of love and beauty to focus my energy and attention on all that is beautiful in the world. It’s so easy to be taken with all that is painful in this world, it's important to have a place to go to that consciously reminds us of love. Would you share a mantra that soothes you? What sorts of challenges did you encounter in writing The Mud & The Lotus? I am very self-disciplined and motivated when I feel passionate, so motivation to write came easily. Being interrupted was a challenge because I had four teenagers living at home when I wrote the book, and four animals in the house. Another challenge was living on my savings and working only part time. I saved for a year to be able to work part time in order to have time to write the book, then I scheduled days and blocks of time simply for writing. In totality, the book took two and a half years from beginning to completion. Once it was complete, my challenge was reading and rereading it over and over again, always wanting to make changes. I suffer from a learning disability that causes me not to see mistakes very easily—my mind reads the word as I think it is on the page and not as it may actually be. I’ve never been diagnosed, but others in my immediate family have dyslexia and dyspraxia and I’ve experienced symptoms that align with those diagnoses. It helps to put text in various fonts and color backgrounds, and to print out the work several times so I catch things. I also am fortunate to have had wonderful proof readers and a great editor to assist me with these challenges. Especially if you have a learning disability, but really no matter what, it’s scary to put yourself out there in print, online, and in person. I try to remember that it’s okay (and human!) to make mistakes. For every person that may find something to criticize, it is important to remember there are many more that we are hopefully helping—even (maybe especially?) by sharing our flaws and admitting our vulnerabilities. What are the parts or pages of your book that you look at and think, "Heck yeah!" I am so grateful for the cover art. It makes me happy every time I see it. When I read the blurbs by people who mean so much to me it makes my heart so full that people have been so benevolent to me and my work. Really the fact that this book was a team effort with proof readers, friends who helped, the editor and publisher, the graphic designer, the photographer. The hand-drawn illustrations make it really special . . . it was my concept, but the team that worked with me to bring the concept to completion. Well that makes my heart overflow with gratitude because they took my ideas and made them even better. There are many I could give, but a specific example is the way the layout designer, Amy Ashford, and editor, Erin Wood, took my cautionary notes, personal stories, and teaching tips, and organized them, integrating them into the layout so that they have their own graphics and are easily identifiable throughout. I hope these sorts of details will make the text a really useful resource for readers. You make a lot of yoga being a lifestyle (versus a workout or a religion), and about it being for everyone. What do you mean? The word yoga means to "yoke" or "bind" together. It can mean joining the mind to the body through practice (breathing, asana, meditation, or our actions in the world), and/or joining yourself with nature or the God of your understanding, and being connected to the greater world beyond our own little world. Doing postures (“asana”) is simply one way of making this connection. Postures can help to balance the body; However, postures are not the only way. When you conserve resources you are doing yoga, when you pray for others you are doing yoga, when you help someone without expecting anything in return that is also yoga. Living yoga as a lifestyle likely means your days are filled with your actions and behaviors aligning with the principals of connecting to your inner self, the God of your understanding, or to something bigger than yourself, and connecting your actions to your love for others. It also means when the “little you” takes over—the Hungry, Angry, Lonely, Tired, Greedy you—that humanness we all share provides us with the tools to get back on track. When we become conscious about these natural human tendencies, we can recognize them for what they are and return to a balanced state. Yoga provides us with countless possibilities in many forms (breathing exercises, postures, meditation, service work, and on and on) for balancing out the inevitable imbalances in our lives. Stay tuned for PART 2 of this interview with Courtney Denise Butler, in which we’ll talk about perceptions of her as a yoga practitioner in her small hometown decades before yoga became a household word, what all those crazy letters after her name mean, and what it was like to be among a handful of yoga therapists worldwide to do beta testing for the new standards of the International Association of Yoga Therapists. Launch of The Mud & The Lotus, October 6! The Mud & The Lotus: A Guide and Workbook for Students of Yoga is now on sale for $39.95 plus free domestic shipping. Order by September 22 to get your signed copy by mail, and stay tuned for details about the Hot Springs, AR, book launch in October. Pictured below, 7 cartons weighing 158 lbs. 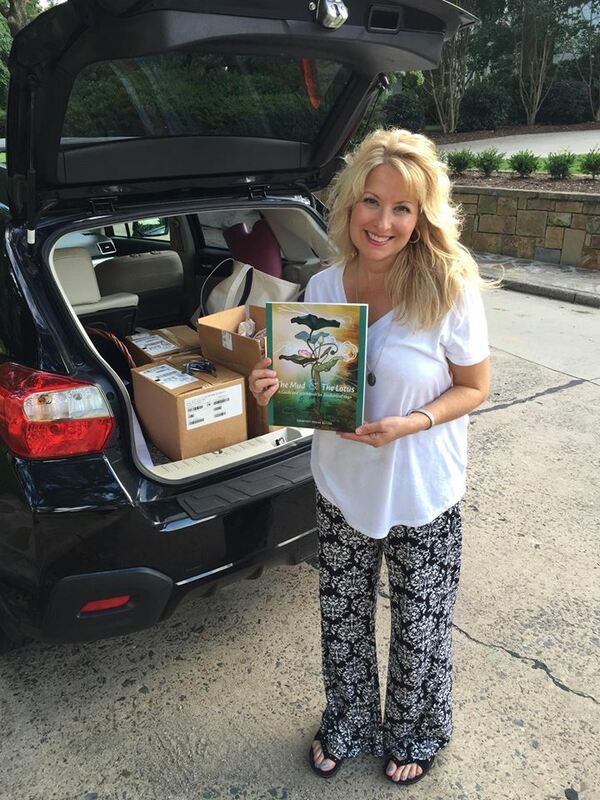 of Mud & Lotus excitement arrive on Et Alia's doorstep, and author Courtney Butler displays the cover as she takes copies to be signed. Thank you to nearly 50 customers for pre-ordering your books, which will be shipped or available for pick up at Balance Yoga and Wellness on September 15, 2017. PRE-ORDER The Mud & The Lotus! In celebration of International Yoga Day, THE MUD & THE LOTUS is now available for pre-order on our website! Buy early, receive a discount, and by mid-September you'll have access to the advice of veteran yogini and business woman Courtney Denise Butler. Want to learn more about Courtney's credentials, which include earning every credential available from Yoga Alliance? Visit her author page to learn more. We proudly welcome this talented author to our Et Alia family of authors. Rooted in the understanding that yoga teachers are themselves lifelong students of yoga, The Mud & The Lotus: A Guide and Workbook for Students of Yoga offers opportunities for aspiring teachers and new students alike to grow in their practice. Guided by hatha yoga traditions, Courtney Denise Butler presents the curriculum she uses to train student-teachers at her Balance Yoga and Wellness Yoga School (R.Y.S. 200/300/500, with a 4.85/5-star Yoga Alliance rating). From the grit to the zen of the yoga world, Butler has developed these lessons from extensive experience in many aspects of the yoga business as well as four decades of personal practice. She shares basic history, physical and energetic anatomy, teaching tips and pose adjustments, essential cautionary notes, detailed professional and business advice, useful approaches for class planning, demonstrative images and illustrations, inspirational personal anecdotes, and much more. The volume includes a workbook that actively reinforces key terms and concepts, and lights the way for self-reflection that will continue to inform teachers as they lead from and beyond their mats. Read list of five-star reviews. “A comprehensive and unique guide to the basics of yoga for students and teachers. Highly recommended!” —Larry Payne, PhD, C-IAYT, E-RYT500. Founding Director, Yoga Therapy Rx® and Prime of Life Yoga®. 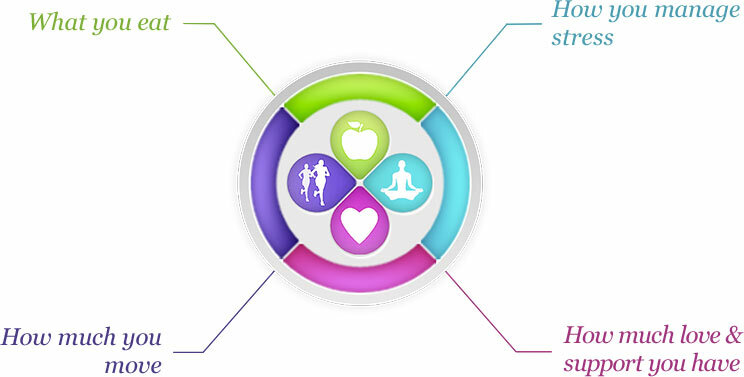 Co-author, Yoga for Dummies, Yoga Rx, and Yoga Therapy & Integrative Medicine. “A wonderfully practical—and inspiring—foundations book based upon Butler’s years of caring experience in the real world. Her chapter ‘Yoga Business Basics’ will be especially valuable to many, with much pragmatic education not readily found elsewhere. Highly recommended for the beginning or aspiring yoga teacher.” —John Kepner, MA, MBA, C-IAYT. Executive Director, International Association of Yoga Therapists (IAYT). “I highly recommend The Mud & The Lotus to anyone currently teaching yoga, or thinking of entering this highly rewarding field. Butler provides teachers—new and experienced—one guide that can support them throughout their careers. . . . taking into account all aspects of being a teacher. Personal stories lend an authentic and warm vibe, so it really feels like Butler is right there with you, supporting you as you develop.” —Karen Fabian, MS, E-RYT. Founder, Bare Bones Yoga. Author, Stretched and Structure and Spirit. Part I of two-part interview with Courtney Butler on Et Alia's Voices Blog. Visit Butler's Creative Space and read Part II of the two-part interview on our Voices Blog.